When is a sliding door your smartest option for an exterior door? 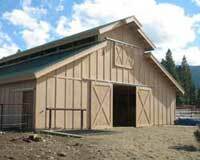 Historically, sliding barn doors have been the reliable answer for agricultural buildings, shops and airplane hangars. Oversized equipment and machinery, demanding large openings, have encouraged the use of sliding doors for years. 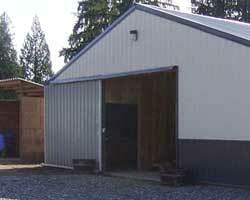 A sliding barn door is reliable against the abuse from animals and the elements. Sturdy sliding door hardware with steel girts is powerful against damages from equipment or machinery accidentally making contact with this heavy duty sliding shop door. You will enjoy not having to install overhead door tracks that would otherwise interfere with interior clearance, allowing full use of the interior of your building. Commercial buildings and residential buildings have followed suit, banking on the cost savings of using exterior sliding doors. The round sliding door track is an amazingly simple, but revolutionary low maintenance system. Self-cleaning, self-aligning and self- lubricating, the round bottom of the track is a no-brainer to keep your door sliding perfectly for many years down the road. Either one-directional or bi parting sliding doors help you to adjust air flow in and out of your building, along with quickly favoring temperature changes. A distinct advantage of sliding barn doors is being able to leave them part-way open for air flow, and yet easily walk through. This gives you access…plus control over your interior environment. 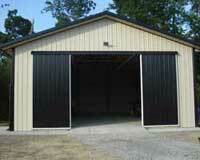 Steel sliding doors will also be far cheaper than Dutch doors on an a horse barn or animal confinement building. They allow quick and easy access for horses or other large animals, while being durable as well as an attractive complement to the curb appeal of your pole barn. In our education video learn what type of sliding door best meets your needs.